Scarce map of Nice, France, at the height of the Belle Epoque. The Traveller's Companion Map of Nice-Town by R. Duquenoy and Foiret. 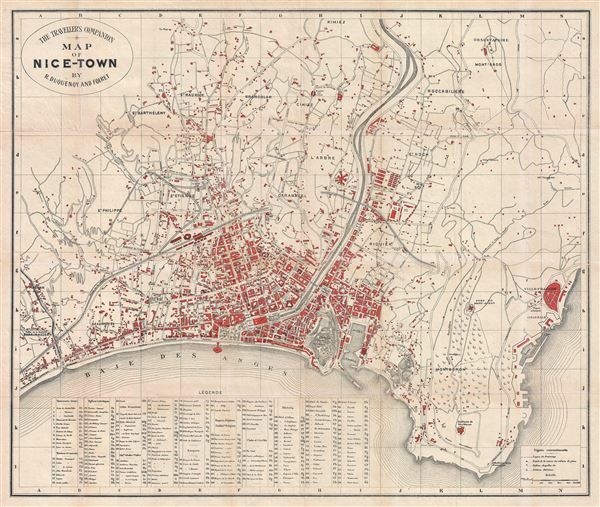 An exceptional c. 1890 map of Nice, France, at the height of its Belle Epoque splendor. Compiled for American travelers in the south of France, this map was composed by R. Duquenoy and Foiret. It covers the rapidly expanding coastal city and its immediate environs extending along the Bay de Anges from Barimasson the the Batterie de Montebaron and then eastward to Villefranche. It extends northwards as far as Rimiez. With the arrival of the railway in 1864, Nice became the vogue destination for aristocratic European hivernants during the winter months. Belle Epoque architecture sprang up throughout the city dramatically expanding its borders and permanently redefining the urban landscape. Nice became a playground where a confident aristocracy could flaunt their wealth and good taste. Despite its popularity during this period, maps of Nice are exceedingly rare and hardly ever appear on the market. Of this map there are only a few known surviving examples, the present offering being the only example in private hands. R. Duquenoy (fl. c. 1850 - 1900) was an American diplomat active in France during the second half of the 19th century. Duquenoy was the secretary to the U. S. Consulate in Nice and was active in promoting American tourism to the south of France. Little else is known of his career. Duquenoy, R., Pocket Guide to Nice, Cannes, Monaco, Mentone Antibes and Grasse, (Nice: Robaudi Brothers) c. 1890. Very good. Backed with archival tissue for stability. Blank on verso. Hand color.